British Columbia Solicitor General Mike Farnworth has introduced legislation in the Canadian province intended to “bring more fairness and transparency” to purchasing tickets to live entertainment events in B.C., according to numerous outlets. The Ticket Sales Act, introduced Tuesday, would outlaw the use of automated “bot” software programs in the province, as well as introduce requirements involving the disclosure of ticket prices, refund guarantees by secondary sellers, and disclosure that secondary sellers are not the original ticket provider, their name, and their contact information. “By establishing a regulatory framework for the sale of tickets in B.C., we would want to ensure that everyone has a fair chance of obtaining a ticket at a fair price,” Farnworth said. The proposed changes come after a public consultation that the government opened in 2018 regarding the event ticket sales process, which saw some 6,000 responses. Proposed legislation stops short of imposing a price cap on resale tickets. It also fails to include any requirement on the part of primary ticket vendors to disclose how many tickets are available to the general public, allowing inventory-throttling and holdback practices that harm consumers to continue unabated. Unsurprisingly, in light of the lack of primary transparency, Ticketmaster has issued a statement in favor of the legislation. “The legislation introduced in British Columbia will improve the overall ticket buying experience and we applaud the Solicitor General and his team for their commitment to the issue,” it reads in part. Ticketmaster and its parent Live Nation have often lobbied heavily against the inclusion of any requirements for transparency as new laws intended to regulate the industry have come up. When similar legislation was originally introduced in Ontario, it included disclosure requirements designed to save consumers from being led to believe an event was sold out, while in reality there were as much as 50% of the building remaining unsold to be dripped later into the marketplace. But that was struck from the legislation after Music Canada Live and Ticketmaster Canada lobbied heavily against the inclusion of such transparency. Farnworth indicated “issues” with posting how many tickets are actually available in his statements this week. “It’s quite a complicated issue because a lot of it depends on how the venue is structured, the nature of the venue and that can change,” he said. Also complex will be the methodology used to calculate what the original price of a ticket was. 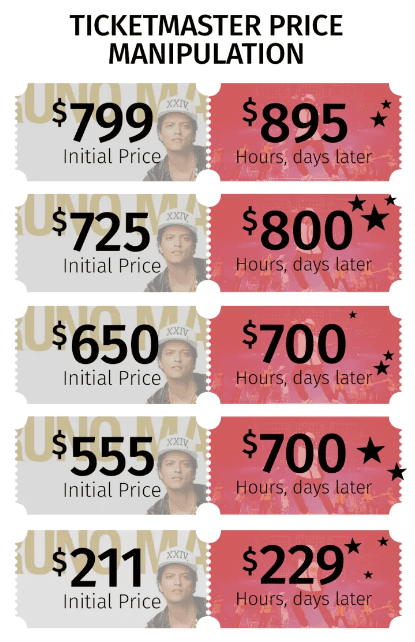 Prices on the primary market are variable depending on the market, as the CBC pointed out in an investigation of one Bruno Mars concert in the fall of 2018. “Within five minutes of tickets going on sale at noon on Feb. 16, it appeared the arena was nearly sold out. Most of what remained were tickets priced at $500 or up to $2,500 for a spot in the front row. As fans scrambled, Ticketmaster ripped a page from the proverbial scalper handbook and began increasing prices for some seats,” the story by Dave Seglins, Rachel Houlihan, Valerie Ouellet and William Wolfe-Wylie says. If the proposed legislation is adopted, those found in violation of policies which fall in line with those proposed by the Live Nation and primary industry lobby would be subject to thousands of dollars in fines.